For the past several months, I have been busy with several things and have not had a lot of time to update this blog or do much writing at all, but I would have been remiss if I had not written something in the lead-up to the upcoming general election for the UK Parliament (Westminster) in Scotland. It is virtually certain that the SNP will win the majority of Scotland’s seats at Westminster, but it is also clear that they will lose some seats, perhaps in the double digits if certain constituencies vote in a way that leads to a pro-Union MP. What I am presenting here are my thoughts and analysis on the 16 constituencies which appear to have a realistic possibility of changing hands from the SNP or are being defended by the solitary Conservative, Labour, and Liberal Democrat MP’s from Scotland. The following commentary is based on polling (insofar as they can be believed and on a national swing), the historical background and trends of these constituencies, the performance of parties at last year’s Scottish Parliament (Holyrood) election and this year's local council elections, and in some cases, the personal qualities of the candidates. I will note that there are caveats to be observed, especially with regard to local elections being an indicator of general election performance, partly because of the use of the single transferable vote (STV) system, as well as due to the number of Independent candidates. Also, some people may simply vote differently in local elections from what they may do in parliamentary elections for Westminster and/or Holyrood. Furthermore, national swings may not pick up local factors which may decide the outcome in individual constituencies, and of course, the polling and my own assumptions may be wrong. 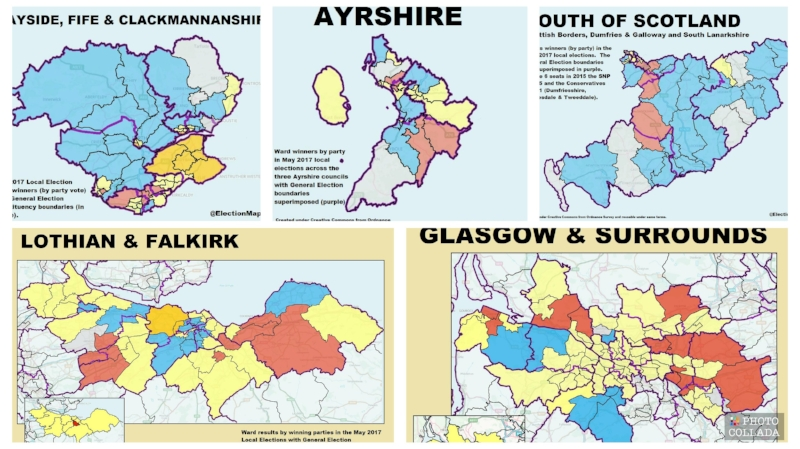 That being said, I believe I have tried my best to explain my reasoning with these constituencies as all three main pro-Union parties attempt to keep what they have and potentially make some gains at the expense of the SNP and place a dent in that party's claim for a mandate on having another divisive separation referendum. Aberdeen South – Within the city of Aberdeen, this constituency in the southern part of the city is currently occupied by the SNP’s Callum McGraig, who won the seat two years ago by defeating Labour’s Dame Anne Begg with a majority of 7,200 votes. It has been in continuous use since 1885, and during that time, solidly voted for Liberal MP’s until 1918 when it began electing a string of Conservative’s in a chain broken only twice in 1966 and 1987 by Labour MP’s – one of whom was Donald Dewar, the future leader of Scottish Labour and inaugural First Minister of Scotland. The Tory hold on this area ended in 1997 with the election of Dame Anne, who went on to hold the seat for the next 18 years and became the first Labour politician to hold it for more than one parliamentary term. During this time, the Liberal Democrats became the main challengers before the SNP leapfrogged both them and the Tories to defeat Dame Anne in 2015. At Holyrood since the first devolved parliamentary election in 1999, the LibDems won this seat via Nicol Stephen until 2011 when its successor seat, Aberdeen South and North Kincardine was won by the SNP’s Maureen Watt. She was re-elected in 2016, albeit with a significantly reduced majority against a 20% surge in the Tory vote under Ross Thomson, who came in second place but nevertheless gained a seat as a regional list MSP for the North East region. Thomson came in fourth when he contested the Westminster seat two years ago, but is now in a position to possibly win it this time around. An overall reaction against the SNP’s obsession for another referendum in a city which overwhelmingly voted to maintain the United Kingdom is working in his favor and he is sure to build on his name recognition and electoral performance over the last two years, which has seen the Tories become the main challengers to the SNP. Local elections this year saw them emerge as the second biggest party in terms of council seats and winning one of the wards which make up the parliamentary constituency. Combined perhaps with tactical votes from the wards where the LibDems were the biggest party, Ross Thomson and the Tories are in a very good chance to win here and help to send a message to the SNP. Berwickshire, Roxburgh, and Selkirk – Covering most of the Scottish Borders council area, this constituency in the southeast of Scotland was the most marginal throughout Scotland at the 2015 general election – with the SNP’s Calum Kerr beating Conservative candidate John Lamont by just 328 votes, and now Lamont, who has held the corresponding seat at Holyrood since 2007, is standing once again for a rematch with Kerr. Both men in 2015 were well ahead of the previous incumbent, Michael Moore, who had served as Secretary of State for Scotland during the Cameron-Clegg coalition government. In turn, Moore represented what had been this area’s affinity with the Liberals/Liberal Democrats since former party leader David Steel won a predecessor constituency from the Tories in 1965 and in fact, Moore was Steel’s successor to the Ettrick, Tweeddale, and Lauderdale seat before it was combined with the equally LibDem seat of Roxburgh and Berwickshire to form the current constituency in 2005, which Moore won and held for ten years. The Tories remained the main challengers here and at the Holyrood level, both seats returned LibDem MSP’s until the aforementioned John Lamont won Roxburgh and Berwickshire. Now known with expanded boundaries as Ettrick, Roxborough, and Berwickshire, Lamont has been re-elected twice, including at last year’s parliamentary election where he grew his majority and won 55% of the vote. Meanwhile, the SNP became the main challengers as the LibDems were pushed into third place. At the local level, the Tories have also grown in strength. This year’s council elections resulted in them being the biggest party in terms of seats on the Scottish Borders Council and in terms of first preference votes cast. More crucially for the upcoming general election, they were the winning party in six of the ten local wards which make up the Westminster constituency where they are the main challengers to the SNP. Assuming the voting patterns of this year and last year hold up, John Lamont and the Conservatives should win this seat. Dumfries and Galloway – Located in the southwest of Scotland, this constituency is located entirely within the larger Dumfries and Galloway council area, and the current MP is the SNP’s Richard Arkless, who defeated Labour’s Russell Brown in 2015 with a 6,500 vote majority. Before 2005 when the present seat was formed, this area’s predecessor seats had been a Conservative-SNP battleground, but voted for Conservative MP’s in every parliament but two since 1931, including Ian Lang, who served as Scottish Secretary and President of the Board of Trade under John Major. Lang’s parliamentary career began when he defeated the SNP’s George Thompson for the Galloway constituency in 1979 and ended when he lost his expanded seat of Galloway and Upper Nithsdale to the SNP’s Alasdair Morgan in 1997. Morgan then lost the seat to Tory candidate Peter Duncan in 2001, and the seat had the distinction of being the only one in Scotland to change hands that year. Four years later, it was largely replaced by the current seat, which was won and held by Labour via the aforementioned Russell Brown for ten years. Meanwhile at the Holyrood level, except for the first election in 1999 which resulted in the election of Alasdair Morgan to the corresponding seat he had at Westminster, the Conservatives have held it and the successor seat of Galloway and West Dumfries since 2003, and at last year’s Scottish Parliament election, the Tories under Finlay Carson (replacing the retiring Alex Fergusson) increased their majority for that seat. During this year’s local elections, they won the biggest number of first preference votes in five of the eight wards which make up the Westminster seat, while also winning the biggest number of votes throughout the entire Dumfries and Galloway council area (which voted overwhelmingly against separation), as well as holding more council seats than any other party. This seat may be close in the end at this election, but so long as the Tories turn out their vote and perhaps get some tactical votes their way, they ought to win this from the SNP. Dumfriesshire, Clydesdale, and Tweeddale – This constituency will be one to watch for the simple reason that it is represented by David Mundell, the Secretary of State for Scotland. His status in that role and as the sole Scottish Conservative MP has made him a target for the SNP, which would love to claim a significant scalp and deliver a blow to prospects of a Conservative revival north of the Tweed. What’s interesting about this area is that it represents an amalgamation of political traditions which has made it a marginal seat and difficult to predict – having elements of the old Dumfries constituency along the border, the Clydesdale constituency to the north, and the Tweeddale, Ettrick, and Lauderdale constituency to the east. Dumfriesshire had been a safe Tory area and held for over 30 years by Hector Munro until Labour’s Russell Brown won it in 1997; Clydesdale and its predecessor seat of Lanark had returned Labour MP’s since the 1950’s; and the Tweeddale/Peeblesshire area has been part of Liberal/Liberal Democrat-voting constituencies since the 1960’s under David Steel. When the current constituency was formed for the 2005 election, it was thought to be a Labour-oriented seat based on notional results from the 2001 election, but David Mundell won it and has held since with an increased majority in 2010 and barely hung on by 798 votes two years ago against the SNP tide. However, changes in voting patterns favorable to Mundell and a more polarized electorate divided over the issue of another referendum has made this election Mundell’s to lose. Last year, the Holyrood constituency of Dumfriesshire, held by Labour since its creation in 1999, had been won by Mundell’s son Oliver in the parliamentary election. At the same election in Clydesdale, the Tories jumped to second place against the SNP, which had taken the seat from Labour in 2011 and the party also showed similar strength in Midlothian South, Tweeddale, and Lauderdale against the SNP, which had also ended LibDem hegemony in this area. Furthermore, at local elections this year, many if not most of the council wards (from the Dumfries and Galloway, South Lanarkshire, and Scottish Borders councils) which make up the DCT constituency were ones in which the Conservatives had won the biggest number of votes. Assuming the aforementioned patterns hold up, David Mundell should be re-elected with a bigger majority, but he needs to get his vote out because we know the Nats will surely turn out their own. East Dunbartonshire – Formerly a long-time Labour area to the north of Glasgow, this seat in its current incarnation had been held by the Liberal Democrats via Jo Swinson from 2005 to 2015 when she lost it to the SNP’s John Nicolson by 2,100 votes. Now Swinson, who was a government minister in the Cameron-Clegg coalition administration, is standing to regain her old seat in a re-match against Nicolson, a former BBC journalist who has become somewhat more known for other things rather than his work as a parliamentarian, such as his apparent role (along with fellow SNP MP Pete Wishart) in applying political pressure on media company STV to sideline digital editor and commentator Stephen Daisley for opinion articles and Twitter activity – at times aimed at the SNP – which displeased him. That aside, what makes this seat interesting is that while Swinson is the odds-on favorite win and some projections have her party winning back that seat or at least within striking distance, the results from last year’s parliamentary election for Holyrood and this year’s local council election don’t bear that out. Again, looking through the history of this area since World War II at the Westminster and Holyrood levels, it is not exactly clear how the LibDem’s managed to win this seat in the first place. In fact, the Conservatives have had better chances here over the years and indeed, they briefly held the old East Dunbartonshire seat in 1974, as well as its successor seat of Strathkelvin and Bearsden in the 1980’s. Labour and now the SNP have been winners here, and at the 2016 Holyrood election, there was a larger vote share and vote increase for the Tories than for the LibDem’s in the corresponding Scottish Parliament seats. At this year’s local elections, the SNP won the biggest number of first preference votes in all of council wards which make up the constituency save for two, and one of them – Bearsden South – was topped by the Tories, who in some projections are better positioned to beat the SNP in the constituency. That said, the LibDems have had decent representation on the council in the two decades since it was formed and they did manage to double their current representation to six seats (second to the SNP and on par with the Tories), albeit that probably had more to do with the vagaries of the STV proportional voting system. Perhaps it all comes down to Jo Swinson as an individual, rather than any party label, and indeed during the run-up to the last general election, it was believed that her personal qualities and reputation as a local MP would save her from defeat. As it was, those factors were not enough against the SNP tide, but perhaps voters are reconsidering her for who she is and what she brings to the table. If enough of them vote based on those considerations, Swinson – perhaps with additional help via tactical voting – may very well return to Westminster. East Lothian – If Labour is going to gain a seat anywhere in Scotland, it will likely be here. Known for Labour politicians such as John Mackintosh and John Home Robertson, since World War II, this area has had a non-Labour MP only three times – from 1951-1966 and February 1974-October 1974 when it was held by the Tories, and since 2015 by the SNP’s George Kerevan, who was elected in the SNP tsunami that year. Most election predictions have it either staying with the SNP or going the Conservatives, but there are two reasons not to count Labour out; it retained the mostly overlapping Holyrood constituency last year on an increased majority and the party was also the largest one in terms of votes cast and seats won at this year’s local council elections. However, it must be remembered that the MSP of the Holyrood constituency, former Scottish Labour leader Iain Gray, has held the seat since 2007 and it is therefore possible that he benefited from a personal vote which was attached more so to his incumbency and not to his party label. Furthermore, as has been stated, local elections are not always solid predictors of parliamentary elections as they tend to be in different years, but since both are occurring just over a month of each other, perhaps a bit more weight ought to be placed on what happened at the May election. If Labour does win, it will be by the slimmest of margins against an incumbent SNP MP with a 6,800 vote majority and a Conservative candidate who may benefit from a national swing toward her party. East Renfrewshire – This is another constituency where a national swing to the Conservatives may yield a gain and like East Lothian, it was a bit of a story to tell. For most of the last century, this seat (known as Eastwood from 1983-2005) was solidly Tory and once was the safest Tory seat in Scotland until Jim Murphy won it during the Labour landslide of 1997 and he held on with increased majorities to make it one of the safest Labour seats in Scotland until he was consumed by the SNP’s own landslide in 2015 and lost to Kirsten Oswald, who now defends a 3,700 vote majority. After 20 years, it appears that this seat will return to the Conservative fold and there is good reason to believe this. Last year, the parallel Holyrood constituency – still called Eastwood and compassing a smaller area – elected Scottish Conservative deputy leader Jackson Carlaw, who defeated Labour’s Ken Macintosh, the person who had held the seat since its creation in 1999. Furthermore, the Tories won the largest number of votes and council seats here at this year’s local elections. The Labour Party has selected Blair McDougall to stand for the seat and as the one-time director of the cross-party Better Together campaign against separation, he has name recognition and pro-Union credentials which make him more likely to win than a run-of-the-mill candidate in an area that voted heavily in favor of the Union in 2014. However, it does appear that if this seat switches hands, it will be Tories who will reclaim an old heartland. Edinburgh South – Labour’s only other realistic chance at this election will be here, where Ian Murray stood alone as the rest of his party colleagues lost their seats two years ago. Not only did he buck the trend against the SNP in keeping his seat, he also managed to increase his majority and this was probably due to some tactical voting by Tory and Liberal Democrat voters, as well as Murray’s personal appeal as an incumbent local MP. Among other things and as a supporter of Hearts of Midlothian F.C., he chaired the Foundation of Hearts, which was organized by fans to save the club and buy it out of administration after its finances had collapsed in 2013. Murray himself, according to the Scotsman, played a “key part in membership drives, fundraising to ensure the club remained afloat and spearheading negotiations with administrators” which resulted in Hearts coming out of administration and on track to be purchased by FOH and its 8,000+ paying members. With this profile and a reputation as a hard-working, responsive, and effective MP, perhaps its no surprise that he managed to hang on in 2015 more so because of his personal appeal than his party label, and he may have to rely on that personal appeal again in the face of the SNP and the resurgent Conservatives. Together, they were the most voted parties at this year’s local elections in the council wards which make up Edinburgh South and the Conservatives have a longer history of holding this seat than Labour – probably most notably by Sir William Darling, a great-uncle of former Labour chancellor and Better Together chairman Alistair Darling. However, Labour managed to gain the parallel Holyrood seat at last year’s parliamentary election and the party is reportedly going all-out here by pouring virtually all its Edinburgh resources into getting Murray re-elected, but it will likely be Murray’s personal relationship with his constituency that will get him over the line. Edinburgh South West – Once the seat of the aforementioned Labour grandee Alistair Darling, it was taken by the SNP’s Joanna Cherry in 2015 and now stands as a potential Tory pick-up if the polls are to be believed. Before the 2005 general election, most of this area was once the Edinburgh Pentlands constituency, which was solidly Tory from its creation in 1950 and most notably held by one-time Foreign Secretary Sir Malcom Rifkind, who was the longest-serving MP for Pentlands until he was defeated by Labour’s Lynda Clark in 1997. Sir Malcolm failed to regain the seat in 2001 and the subsequently reorganized South West constituency was held by Labour for ten years. Meanwhile, the parallel Holyrood seat – still named Pentlands – has been held by Labour, Conservative, and SNP MSP’s (including the late former Scottish Conservative leader David McLetchie) since its creation in 1999. The Conservatives came in second place here at the 2016 Holyrood election and at the local elections this year, they were also the most voted party in the council wards which make up both constituencies. This seat may come down to the wire on election night, so if the Tories want to win this seat, they will have to turn out their vote and probably hope for some tactical pro-Union support from Labour and LibDem voters. Edinburgh West – It’s probably safe to say that this seat has gotten much attention over the last two years because of its current occupant Michelle Thomson, who was elected in 2015 as an SNP MP, but resigned the party whip before the year was out to sit as an Independent in the face of controversy and alleged impropriety over past property dealings. She’s not standing at this election and the Liberal Democrats – who lost the seat to her – are seeking to retake it as one of their target seats, and they have good reason to feel positive about their chances. At the Holyrood election last year for the overlapping constituency of Edinburgh Western, the LibDem’s via Alex Cole-Hamilton took back that seat from the SNP and at this year’s local council elections they were the most voted party in most of the council wards which make up both constituencies. That being said, this was once a solid Tory seat from 1931 until 1997 when the LibDems gained it, and as with just about elsewhere in Scotland, the Tories are gaining steam. However, this is also among the seats where one or more of the three pro-Union parties are not actively campaign and using precious resources in a constituency where they know they won't have a chance, so that the party with the best chance of beating the SNP will do so. Here in Edinburgh West, that would appear to be the Liberal Democrats, whose candidate is Christine Jardine, who unsuccessfully contested the Gordon constituency against Alex Salmond in 2015. Recently, an SNP supporter publicly and falsely accused her of campaigning during the period when political activity was suspended in the wake of the Manchester terrorist attack when in fact, she was out burying her husband. This controversy once again raised the profile of this particular race and its importance to all concerned. For the LibDem’s in particular, it will be a building block back to relevance and for those of a pro-Union persuasion generally, winning this seat will be an important step forward in turning back the SNP tide. Moray – If anything may signal the state of the SNP for better or worse, perhaps no better expression will be found than here, where Angus Robertson, the party’s deputy leader and Westminster group leader has been MP since 2001. This area was once reliably Conservative expect for when the SNP won the predecessor constituencies in 1974, but since this constituency was created in 1983, the Conservatives won it only on the first time and the SNP has held it since 1987. The party has also held the parallel Holyrood seat since its creation in 1999, but the Tories managed slash the SNP majority from 38.3% to 8.6% during the 2016 parliamentary election and in 2017 for the first time, they were the biggest party in terms of votes cast in the Moray Council election (though the SNP won more seats). Additionally, Moray had the highest Scottish “Leave” vote in the EU referendum (49.9%) and also voted against separation by a margin of 57.6% to 42.4%. With all being said, this is a prime area for the Tories, but Robertson is a formidable incumbent who will be hard to dislodge and – this can’t be stressed enough – council elections and referendums are not necessarily the best predictors of parliamentary elections. They will have to maximize what appears to be their core vote in the northwest of the constituency and elsewhere to claim this top scalp from the SNP. North East Fife – Once solidly Liberal/Liberal Democrat for nearly 30 years under Sir Menzies Campbell, it fell to the SNP’s Stephen Gethins in 2015. Before that, it and its predecessor seat of East Fife tended to vote for Tories since the 1930’s and traded between the Liberals and Tories in the late 19th and early 20th centuries, with its most notable occupant likely being the Liberal Prime Minister, Henry Herbert Asquith. In the present day, the Liberal Democrats are eyeing this seat as another one to take back from the SNP, but the Tories appear be gaining strength here as well and the SNP itself is not to be counted out. However, the LibDems unexpectedly won the corresponding Holyrood seat of the same name via their Scottish leader Willie Rennie at last year’s parliamentary election and the Fife Council wards which make up the constituency gave their biggest number of first preference votes to the LibDems at the council election this year. To win this seat and the others already mentioned as well as holding on to Orkney and Shetland would be a good night for them, all things considered, but as with everywhere else, they will have to turn out their usual voters and probably hope for tactical votes from other parties. Orkney and Shetland – This is a seat with two main story lines attached to it. One is of political longevity, because save for a 15 year period from 1935 to 1950, Orkney and Shetland has been sending Liberal and Liberal Democrat MP’s such as Jo Grimond and Jim Wallace continuously since 1837, with the streak since 1950 being the longest run within any British parliamentary constituency and making it at one time, the safest seat for the LibDems. For Scottish parliamentary purposes, the islands were split into two constituencies which have elected Liberal Democrats since their creation in 1999, and these became the last LibDem bastions in Scotland after the near wipeout of 2011 when they lost all of their mainland constituencies to the SNP, partly in response to their role as coalition partners with the Conservatives at Westminster. At the 2015 UK general election, then-Secretary of State for Scotland Alistair Carmichael held on to Orkney and Shetland with a reduced majority during the SNP landslide as he became the last Liberal Democrat MP in Scotland. This leads to the second story - one of political survival. After holding on to his seat, Carmichael – who has been in Parliament since 2001 – faced an attempt to have him removed from office by four constituents in Orkney over the “Frenchgate” memo controversy during the general election when he stated that as Scottish Secretary in the coalition government of David Cameron, he knew nothing of a leaked memo which said that Nicola Sturgeon told the French ambassador that she actually preferred Cameron as prime minister as opposed to then-Labour leader Ed Miliband. When it turned out that Carmichael was involved in the leak and he admitted to it, the “Orkney four” lodged a petition for his removal and force a by-election. Carmichael was eventually found not to have committed an “illegal act” and he kept his seat, but there seemed to have been untold damage to his reputation and the electoral chances of his party in Orkney and Shetland. However, it seemed that the voters may have been turned off by what many people believed was a political witch-hunt to force out the last Scottish LibDem MP, and at the Holyrood election last year, the Liberal Democrats retained the separate Orkney and Shetland constituencies with increased majorities under Liam McArthur and Tavish Scott respectively. Meanwhile, this year’s local election can’t give any indication of which way the general election will go because Shetland Council and Orkney Council are heavily stocked with Independent councillors. However, most polling and projections have Alistair Carmichael surviving for another Parliament, perhaps with an increased majority – maybe an indication people being tired of the SNP and/or some tactical voting, but probably more so that voters have moved on and recognize him as their local MP who has worked in their interests for 16 years. Perth and North Perthshire – The current occupant of this seat has in some way become more known for his use of Twitter than his work as an MP (winning Parliamentary Tweeter of the Year Award for 2015), particularly with regard to calling those who voted “No” in 2014 “nawbags” and sharing a tweet with foul-mouthed references to pro-Union parties in the lead-up to the council elections this year. He was also the alleged co-conspirator (with the aforementioned John Nicolson) in leaning on STV to sideline digital editor and commentator Stephen Daisley for opinion articles and Twitter activity – sometimes aimed at the SNP – which displeased him. In so doing, he has become a significant target for those wanting to get rid of him. Pete Wishart has represented this area since he was elected to what was Tayside North in 2001, following in the footsteps of John Swinney, who now represents the corresponding seat of Perthshire North at Holryrood and is currently Deputy First Minister and Education Secretary in the Scottish Government. Before either of them, Perthshire regularly returned Conservative MP’s, including political notables such as Prime Minister Sir Alec Douglas-Home, Sir Nicholas Fairbairn, and Bill Walker. Only once before the modern era of the SNP did that party win here, and that was when Douglas Crawford held the Perth and East Perthshire seat from October 1974 to 1979. However, the SNP remained the main challengers to the Tories in the Perthshire area constituencies, and following the death of Nicholas Fairbairn in 1995, his Perth and Kinross seat went to the SNP’s Roseanna Cunningham in the resulting by-election. Two years later, John Swinney won Tayside North from Bill Walker during the 1997 Labour victory which saw the Tories losing all of their Scottish seats. Wishart succeeded Swinney in 2001 when the latter stood down to focus on his work at Holyrood and when the current Perth and North Perthshire seat was formed in 2005, the Conservatives narrowly lost it to Wishart, who has since increased his majority in subsequent elections. However, the party is potentially looking its best chance to regain a foothold in Perthshire. At last year’s Holyrood election, Swinney saw his majority slashed from 10,300 votes to 3,300 in a 12% swing to the Conservatives and this year’s local elections saw the party become the largest in terms of votes cast in the Perth and Kinross council area (60% of which voted against separation) and number of council seats. More crucially, the party also received the biggest number of votes in all of the council wards which make up Wishart’s constituency except for the city of Perth itself. Victory for the Conservatives is indeed very possible here, especially with Perthshire native and European Parliament member Ian Duncan standing this year, but he and his party will have to maximize their vote in the northern and rural wards where they are most favorable and perhaps also hope for tactical votes from elsewhere in order to send Wishart looking for musical gigs and to send a message that they are back in business in Perthshire. Stirling – This constituency at the heart of Scotland is conterminous with the Stirling council area and is currently represented by SNP MP Steven Paterson, who won it by a hefty majority of over 10,000 votes two years ago. Before then, the seat had been held by the Labour Party via Dame Anne McGuire since 1997 when she defeated the Conservative Scottish Secretary Michael Forsyth – the inaugural holder of the seat since its creation in 1983 – who was one of the major political scalps in that general election as a cabinet minister and a casualty of the Tory wipe-out in Scotland. Like Dumfriesshire, Clydesdale, and Tweeddale to the south, it represents an amalgamation of old political traditions. The northern and more rural area used to be part of the Kinross and Western Perthshire constituency which had been represented by Conservatives such as Prime Minister Sir Alec Douglas-Home; the old West Stirlingshire elements and the area including and surrounding the city of Stirling were more geared towards Labour. The result was a constituency that began as a safe Tory seat, then became a Tory-Labour marginal, and then a safe Labour seat before falling to the SNP in 2015. At Holyrood, the corresponding seat – also called Stirling – was represented by Labour from 1999-2007 and has since been held by the SNP. However, the Conservatives have remained steady at around a quarter of the vote in both the Westminster and Holyrood constituencies, and at last year’s Holyrood election, they made gains to come in second place in Stirling. The local elections this year saw them emerge as the party with the biggest number of first preference votes and on par with the SNP in terms of seats on Stirling Council. The ward maps show the strongest vote for the Tories came from the northern and western wards, so if they can maximize their vote there, find some votes elsewhere (especially in the suburbs around Stirling), and can benefit from some tactical voting, they may well regain this for the first time in 20 years. West Aberdeenshire and Kincardine – Located within the Aberdeenshire council area in the northeast of Scotland, this constituency is currently held by SNP MP Stuart Donaldson, who won it in 2015 with a majority of 7,000 votes from the Liberal Democrat Sir Robert Smith, who had held it since it was created in 1997. Before that, this area had typically returned Conservatives to Parliament, though Liberals and Liberal Democrats have had breakthroughs from time to time and provided the main competition to the Conservatives. This Tory-LibDem dynamic remained true after the LibDems became the dominant party in the 1990’s and continued until the SNP ascendancy two years ago, which resulted in the LibDems being pushed into third place, behind the SNP and Tories. At the Holyrood level, the first devolved election in 1999 resulted in the Liberal Democrats winning the corresponding seat under Mike Rumbles, who then held it until 2011 when he lost the successor seat of Aberdeenshire West to the SNP’s Dennis Robertson. Five years later, Robertson lost the seat to the Tory candidate Alexander Burnett by 900 votes. This was one of the surprise events of the 2016 Holyrood election, and it showed the ultimate potential of Conservative strength in the North East against the SNP on a night when other constituencies like this one experienced sharp swings from the SNP to the Conservatives. Then at the local elections this year where the party ended up with more seats on the Aberdeenshire Council than any other party, it was also the winner in the wards which comprise the Westminster-level constituency. Combined with the fact that this area voted heavily in favor of maintaining the UK, it’s virtually clear the Conservatives are favorites to win here against the SNP and regain another old heartland. These are the 16 constituencies which I believe may possibly be held by a pro-Union MP at this general election. Some of them are more certain to turn out that way than others, but as I have stated, there are caveats and I am prepared to be wrong. Of course, I hope I’m not wrong and that all of these seats will be held by a pro-Union MP’s, if not potentially more. Indeed, I have heard some rumblings about places such as Rutherglen and Hamilton West returning to Labour, Edinburgh North and Leith potentially becoming Conservative territory, and perhaps even one of the Highland seats being re-gained by the Liberal Democrats. Another one is the Gordon constituency held by former First Minister Alex Salmond, which some are hoping will change hands to deliver a bloody nose to the SNP. In fact, there is some reason to believe that it may for much of the same reasons as Aberdeenshire West and Kincardine. However, there was not enough for me conclude that they are likely to flip from the SNP and in Salmond’s case, his notoriety alone makes me hesitant to say that he will likely lose his seat. The same holds for his old seat of Banff and Buchan, which may vote Conservative based on Brexit and the council election results, but the polling and projections have yet to show enough of a swing to the Tories to say that the constituency will vote for them. If anything, what I have tried to do here is base what I have said on polling, trends, and reasoned assumptions, which has resulted in a relatively realistic, but hopeful outlook. Indeed, one encouraging element of the polls has been the apparent decline in support for separation and the SNP, which in turn makes it more likely that more seats will elect a pro-Union MP - if not now, but in the future should this trend continue. For now, the only poll that matter of course is the one on June 8th, and we shall see by Friday morning how right or wrong we all were about this election, especially with regard to Scotland, and I definitely hope that enough of an impact will be made to make the SNP think again.